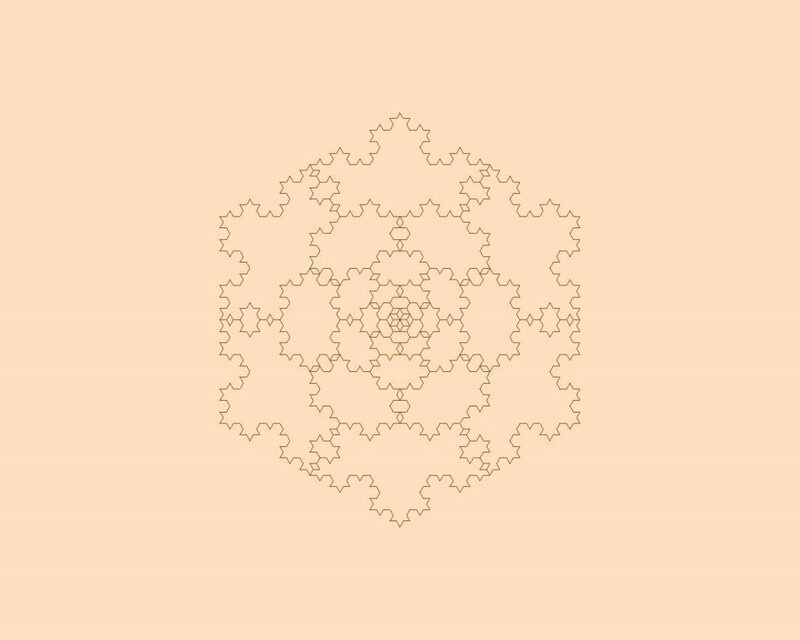 Two of the most famous fractals are the Sierpinski Triangle and the Koch Snowflake. If the size is less than 1/8 inch, exit. 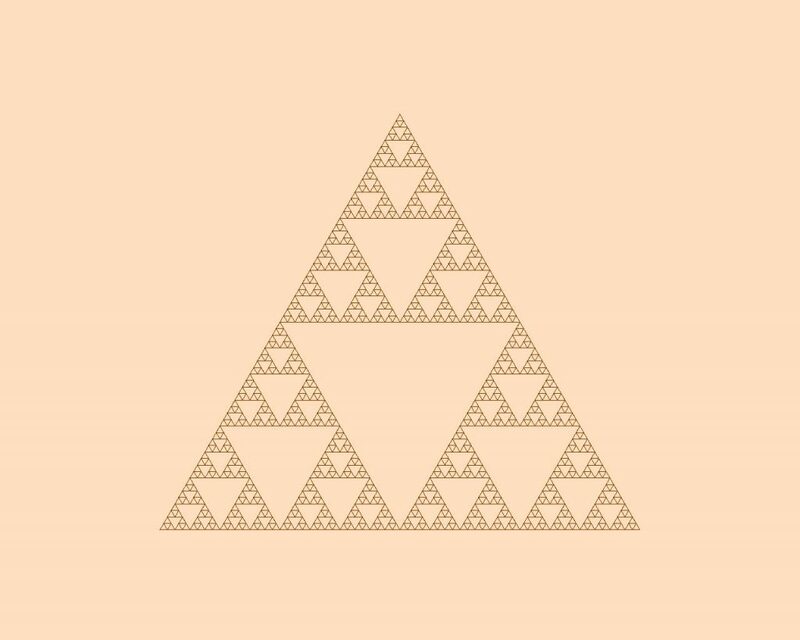 Draw another Sierpinski Triangle starting with the size divided by 2. Draw a line using the size for the length. Turn right 1/3 of the way around. Clear the screen with the tan color. Use the dark brown pen. Start 4 inches to the left and 3-1/2 inches down from the screen’s center. Turn right 1/12 of the way around. 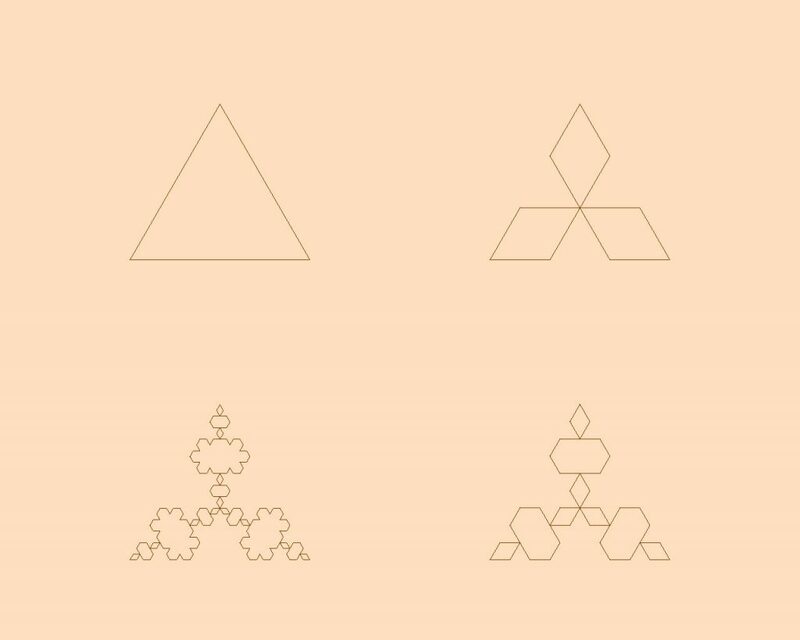 Draw a Sierpinski Triangle starting with 8 inches. Triangles within triangles within triangles. Nifty. Draw a Koch Curve with 3 inches and the depth. Turn left 1/3 of the way around. If the depth is 0, draw a line using the size for the length; exit. Put the size divided by 3 into a new size. Draw the Koch Curve given the new size and the depth minus 1. Turn right 1/6 of the way. Draw a second Koch Curve given the new size and the depth minus 1. Turn left 2/6 of the way. Draw a third Koch Curve given the new size and the depth minus 1. Draw a fourth Koch Curve given the new size and the depth minus 1. 1. At the top-left, we see that our snowflake, at depth zero, is just a simple triangle. 2. At the top-right, one level deeper, we see that each of the sides of the triangle has been divided into three parts, the middle part being replaced with a “peak”. 3. Continuing clockwise around the screen, at the bottom-right, we see that at the next level down, each of the sides of preceding figure is again divided into thirds, with the middle third being replaced by a peak of the appropriate size. 4. Finally, at the bottom-left, yet another level down, we see the finished snowflake. I say “finished” even though we could go deeper and deeper if our screen had the resolution to display it clearly. Something curious happens if, when we’re drawing a Koch Snowflake, we turn right instead of left at each of the original vertices (the revised routine is shown below, with the modified word in all uppercase letters). Turn right 7/12 of the way around. Move up 1/2 inch. Draw a Koch Snowflake given 4 inches and 3. Turn right 7/12 of the way around. 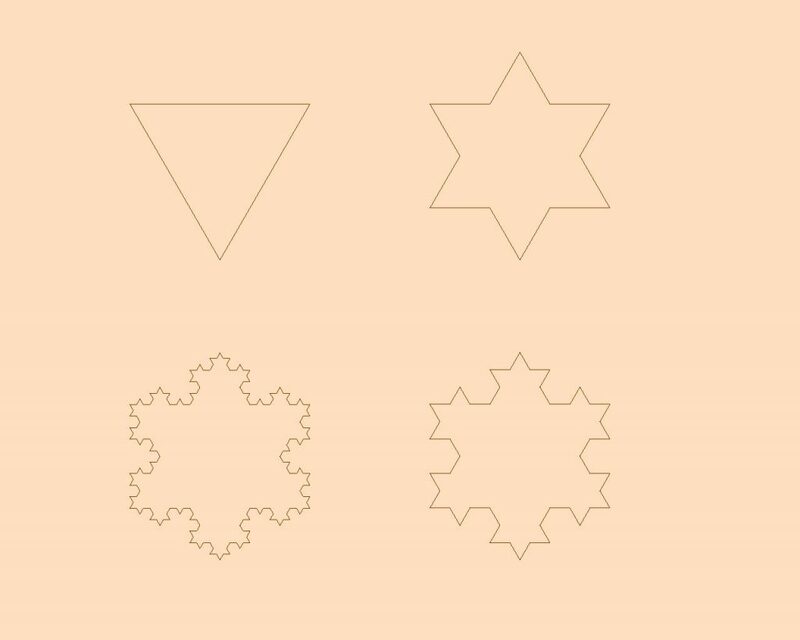 Draw a Koch Snowflake given 3 inches and 3. Turn right 1/6 of the way around. Add 1 to a count. If the count is 6, break. Well, I could go on all day with this kind of thing, but I’m sure you get the idea. More fun and interesting programs written entirely in Plain English.